Just code it! | SoloLearn: Learn to code for FREE! The world is crazy for mobile! SoloLearn loves everything mobile too, so we've created another valuable tool for the cool geek’s mobile toolbox. 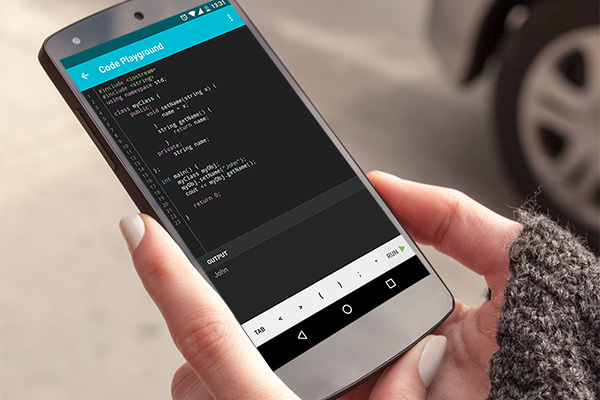 Meet our brand new mobile code compiler, Code Playground! It's the world's most user-friendly compiler and debugging tool, and it brings the functionality of SoloLearn's apps to an entirely new level. With the Code Playground, you can write and run code right within your mobile app, and then view the output. This article will tell you what you can do with Code Playground, and why we think you'll be playing with it all the time. We'll also let you know what we're planning next! Let’s get started! Open the Code Playground section in one of our apps or on the SoloLearn website, write your code, and watch how it works - visually and in real time. You can also run the code samples in our courses using the Try It Yourself button. Simply make a change in the code and click Run. You'll be able to see the results of your changes in the Output. Dark and Light color themes are available in the Code Editor. And this is just the beginning! We're working on exciting new Code Playground features. For example, you will be able to Save and Share your codes, add custom input to your programs, zoom in and out, and more! If you’re reading this, I probably don't need to tell you why learning to code is a good idea. Skilled programmers have been in high demand for years now, and it doesn’t look like that demand is about to decrease anytime soon. But even if you don’t intend to make a living as a professional programmer, being a proficient coder will come in handy in any job. You already know that, and I'm sure you know something else, too - it does take a lot of time and practice to become a good coder. We offer a fast and fun way to practice. Open your SoloLearn app and try out any code you like, anytime and anywhere! Doing this will give you the experience you need to become a code pro, while also giving you a result you can be proud of. Remember, the best way to learn coding is coding and don’t forget to have fun!